Are they chic? Probably not. Are they charming? I say yes! Viktor and Rolf clogs from the Fall 2007 collection inspire strong reactions. Do you love them or do you hate them? Most girls I talk to think they look silly, costumey and uncomfortable. I'm very attracted to them, but fully admit I would not be willing to shell out designer prices to wear them. I think they are kind of romantic. There can be no doubt that these shoes are not mass manufactured. 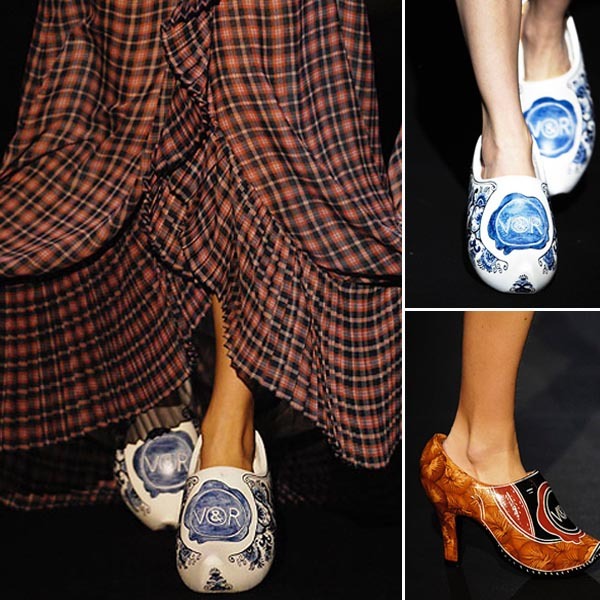 I like to imagine that they were hand carved and painted by a Dutch artisan who's family has been making clogs for hundreds of years. I also really like how dainty one's ankles look in juxtaposition to the chunkiness of the clog. I LOVE them and would totally wear them...if they were comfortable. Very fun! They look unbelievably uncomfortable! Are they high fashion's response to the croc? lol! horrible! You know, its doesnt matter what the others have said, it think it looks cute.